Buckets of free black currants is what we were used to. Every summer we picked them in our own garden, ate them with relish (until our tongues ached) and preserved them to last through the long Siberian winter. In America currants are not easy to find, and when you do find them be ready to shell out. This unfortunate scarcity was caused by a national ban on black currants that lasted nearly a century and came about through no fault of the berry. Black currants are not only lush, extremely aromatic and unique in taste, but are also loaded with antioxidants and an array of vitamins. 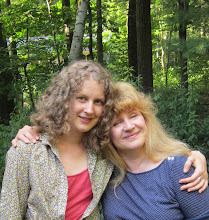 This weekend, after 14 years of estrangement we got to have some. The Russian supermarket we went to happened to have tiny containers filled with black currants still holding on their fragile clustered pedicels. What a find! We grabbed one at almost $6, and hurried home in anticipation of nostalgic treat. There is no recipe for this wonderful dessert. Just buy some simple vanilla ice-cream, and arrange it in a bowl with generous amount of currants and a splash of black currant liqueur (or jam mixed with brandy). Sit back and indulge in it! 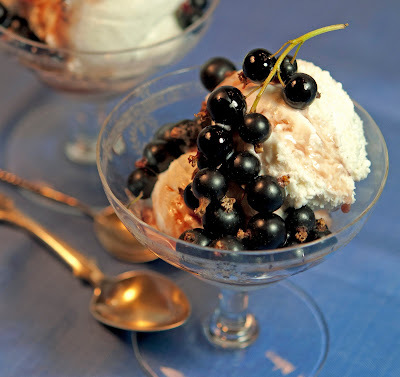 An even more simple way to eat black currants is to whip 1/2 cup sour cream with 1 tbsp sugar and mix it with berries. That's what we used to make back then, in the shabby summer kitchen of our country house (dacha). If you happen to live near a farm that grows black currants, ask the farmer to kindly allow you to cut off some young currant twigs with leaves. They make a delightful fragrant tea. Pour boiling water over leaves and twigs in a roomy teapot, let it brew for some time, and drink with delight, adding sugar or honey to taste.